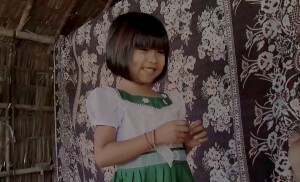 Sabai is delighted to be able to send her young daughter to school. But disaster strikes when she cannot afford to buy a school uniform. What will it cost this loving mother to get her little girl what she needs? This short drama was shot in and around Hlegu, a small agricultural township around 45km north-east of Yangon. workshops in communities in Kachin and Chin. The School Uniform marks her debut as a director of fiction. Screenwriter Cham Htet Han also works as a radio writer, actor and announcer. His other writing credits include working on the The Team Myanmar TV series. In 2015 he won the YFS-Goethe Institut Feature Film Pitching Competition for his feature film project The Man in the Room which he is currently developing with support from YFS. Producer Soe Arkar Htun was just 19 when he was accepted to YFS in 2014. His first documentary A Political Life won the 2016 Watersprite Filmmaker of the Future Award. He edited fellow-student Wynn Htut’s documentary Floating Life in 2015 and is now developing a documentary The Journey about young people in transitional Myanmar. The School Uniform is his first film as a producer. The School Uniform is a short fiction film inspired by a real-life story. It was filmed with non-professional actors and was produced by Yangon Film School (YFS), an award-winning non-profit organisation dedicated to supporting a diverse media culture in Myanmar.